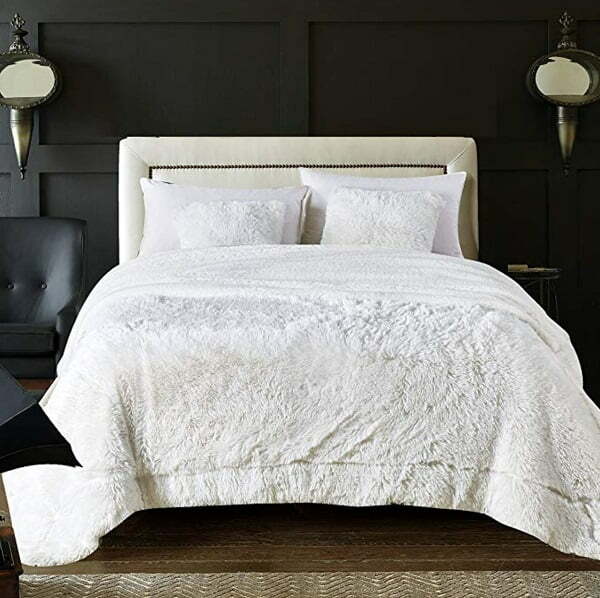 Want to add a classy, luxurious accent to your home or snuggle up in a comfy faux fur blanket? 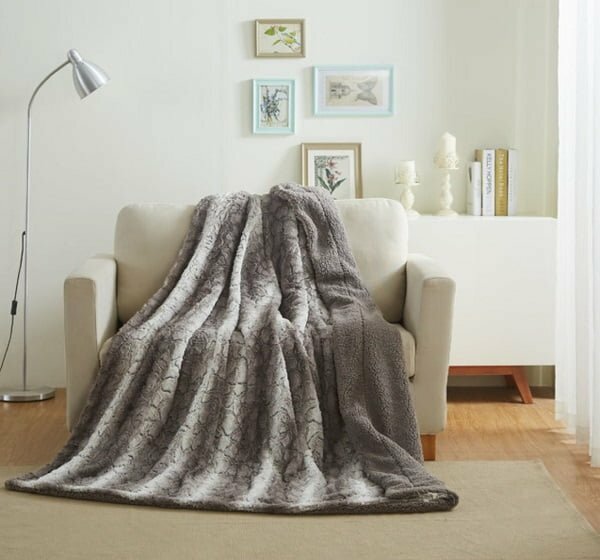 Here are the top 10 best rated faux fur blankets you can get in 2019. Fur has always been an item of luxury. Anywhere you see it in the interior design it speaks volumes about the classy and luxe decor. As a material, it has high-impact texture and has qualities that make it extra comfortable as a blanket. But there are ethical issues about using real fur. That’s why faux fur blankets have become all the hype as an alternative to the real thing. You can use a faux fur blanket to snuggle up on a couch to read a book or watch TV. Or you can use it as a bedspread and make your bedroom look like a 5-star hotel room. And you can drape it over a chair for that high-impact decor accent. You may want to use a fur blanket as a photo shoot prop too. In any case, you can enjoy the great benefits of fur and at a fraction of the cost of the real thing. All you have to do is choose the right faux fur blanket. And that’s where we make it easy for you. We’ve made a list of the top 10 best faux fur blankets in 2019, so you don’t have to wade through hundreds of options available. Which one will you choose? While we list this faux fur blanket as black here, it does come in a wide variety of color – there’s no problem in finding the right fit for your decor. This high-grade fiber faux fur is an Amazon’s Choice for a good reason. The 3,500 positive customer reviews have caught our attention, and we did not get disappointed. It’s a very affordable blanket that feels good just as it looks good. Why it’s our pick? 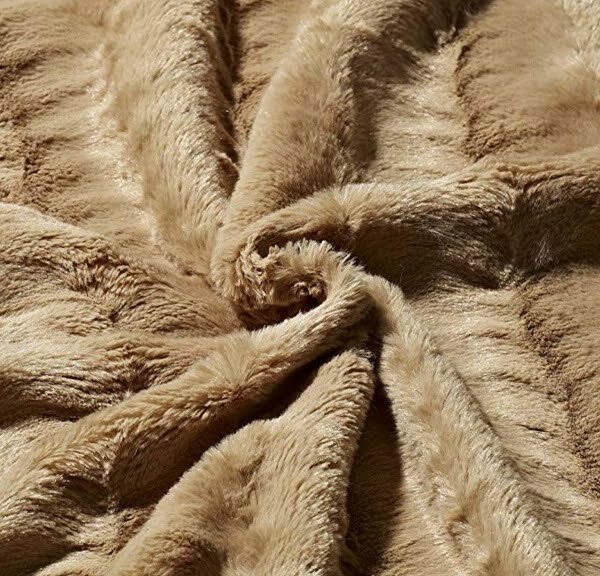 We love to snuggle up and feel the embrace of luxury – that’s what this faux fur blanket can offer. This faux fur blanket looks and feels very real. It’s thick, soft and realistically heavy, the fur hair feels real between your fingers, and it folds down naturally when thrown on a piece of furniture. Thus it makes a luxurious decor accent and a comfy blanket – nobody will believe you’ve paid so little to get it. It’s made of acrylic fiber, and the blanket is lined with faux rabbit fur. That’s what makes it fall so nicely and feel so comfy. It is quite delicate, though, so you’ll be able to machine wash it gently in cold water only. 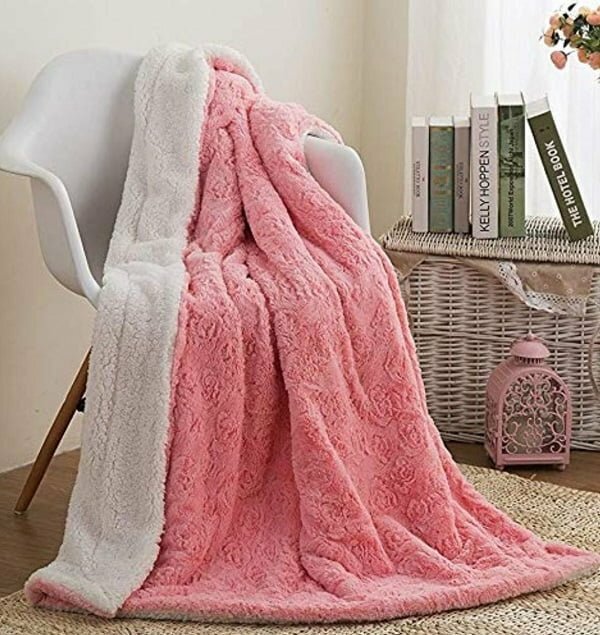 You can choose this blanket in several different colors and patterns resembling authentic fur of real animals (without any harm done to them.) There are three different sizes to meet your needs too. Why it’s our pick? This fur blanket is very realistic, plush and cozy. It’s a real luxury item to have at home. If you’re one for shabby chic decor, this pink faux fur blanket in a rosy pattern is a striking accent for the style. If pinks is what you’re looking for, this blanket will do nicely. It’s very soft, reasonably warm and very light. That doesn’t make it very realistic (nor does the pattern) but it doesn’t hurt the comfort and the look. The bright pink will work as a decor accent in any eclectic room, girls room, or anywhere you want to make a high-impact luxurious decor accent. As a unique blanket, it will work as a great gift too. Why it’s our choice? It’s an interesting pink faux fur blanket in a pattern that makes a high-impact decor item. Looking for a full spread in faux fur for your king size bed? This king size blanket will do the trick, and it will lie on your bed nicely to give it a luxurious effect. Indeed, your master bedroom will look hotel-grade with this decor accent. The faux fur blanket is made of high-grade fiber, it doesn’t shed, feels soft and comfy and it looks very stylish. It’s easy to wash and dry too (make sure you’re gentle with it.) You can choose from a few different colors and sizes also. Why did we choose this product? It’s a high-quality faux fur blanket in king size. It’s a great product with a ton of positive customer reviews. If you want to spread an extra fluffy faux fur blanket over your queen size bed, this item will do the trick. It’s thick, soft, and comfy. So you’ll enjoy cuddling up in it, not only spreading it over your bed. It will make a classy, luxurious accent in the bedroom at a meager price. Why it’s our choice? It’s a very affordable queen size faux fur blanket and a high-quality product. Looking for a unique luxury accent in your new faux fur blanket? Try this snow giraffe color and pattern blanket. It’s as soft, warm and snugly as you’d expect a fur blanket to be. And it gives your decor the extra touch of pattern and texture in this classy luxe accent. Why did we pick this blanket? It gives a unique touch to your decor while being comfy and inviting as a faux fur blanket should be. When regular size is not enough, get an oversized blanket. This huge faux fur blanket will be enough to snuggle in and feel extra comfortable. It’s quite thick too, in fact, it’s thick enough to be used as a rug on the floor. The faux fox fur looks very realistic, and it will add a wild luxury accent to your decor without any harm done to animals. Why it’s our pick? 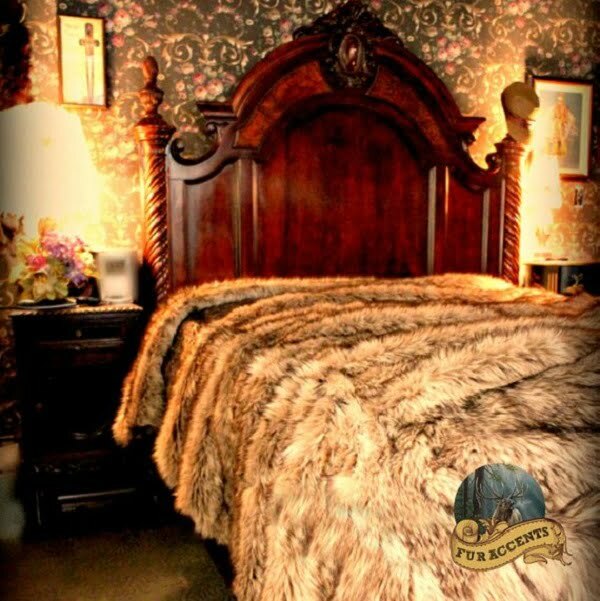 It’s an amazing handmade faux fox fur blanket in extra big size. 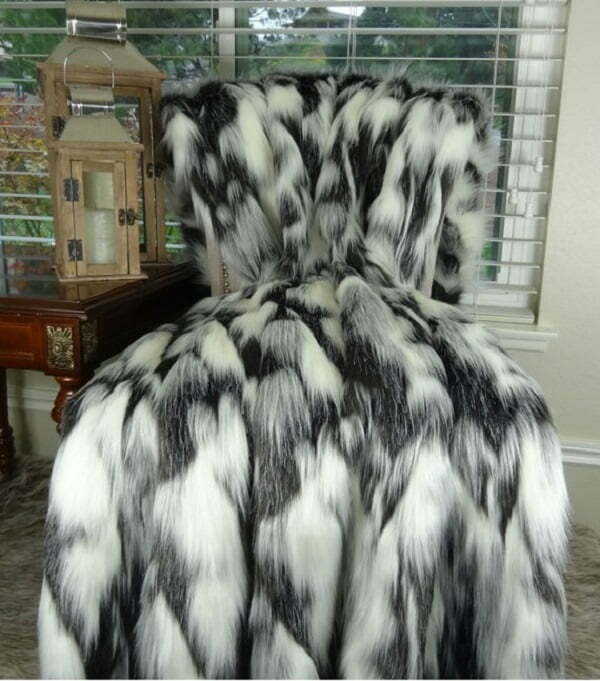 Black and white patterns are always classy and combined with the faux fur texture they make a luxurious decor feature. You deserve this item in your home. It comes in several standard sizes, and it will meet all your needs. The blanket is as comfy as you’d expect a fur blanket to be. Why choose this blanket? If you like the pattern and want a high-quality handmade product, this faux fur blanket will be a great choice. This is one of the most customizable and luxurious faux fur blankets. It can hardly even be called a blanket as it’s more of a bedspread or a comforter duvet. In any case, it will add a striking decor accent to be talked about. It’s a handmade item too, ensuring it’s an extra high-quality product. So you get what you pay for in this case. Why it’s our pick? 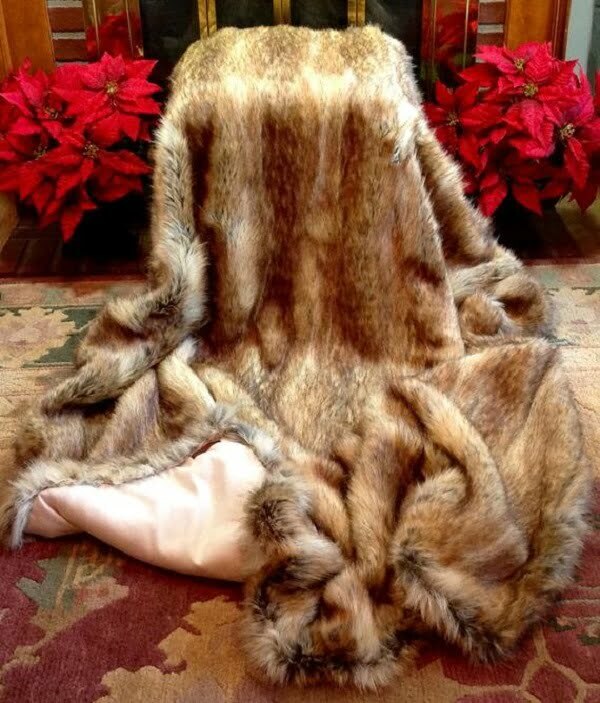 It’s a very nice handmade luxury faux fur blanket that’s worth the price. 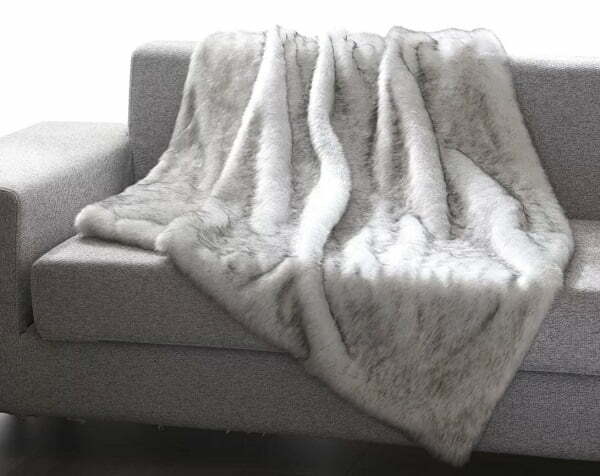 We saw this faux fur throw blanket on Wayfair and fell in love. It’s a simple and inexpensive throw in lovely faux fur, but it’s soft and cozy enough to snuggle up comfortably on a couch. It makes a charming decor accent draped over a sofa or a chair too. What else is there to require from a fur throw? Why did we choose this blanket? It’s a nice simple faux fur blanket stylish and comfy enough to meet any needs.